SOUTHAMPTON, N.Y. – One was about power. The other was about patience. He never lost hope when he began his title defense with a 75 and was 7-over par midway through the second round. He didn’t lose his mind in the most punishing third round of a U.S. Open in nearly two decades. And with a cool head and a hot putter, he didn’t give anyone a chance down the stretch Sunday at Shinnecock Hills. Koepka won with birdies on spacious Erin Hills last year. The signature moment from this U.S. Open was a trio of putts to escape trouble on the back nine – two for par, one for bogey. Koepka took a two-shot lead with a wedge to 3 1/2 feet for birdie on the par-5 16th, allowing him a safe bogey on the final hole to finish at 1-over 281. It was the first time since 2013 at Merion that no one broke par, and it was 13 shots more than his winning score at Erin Hills. “Hell of a job,” Strange said to him. 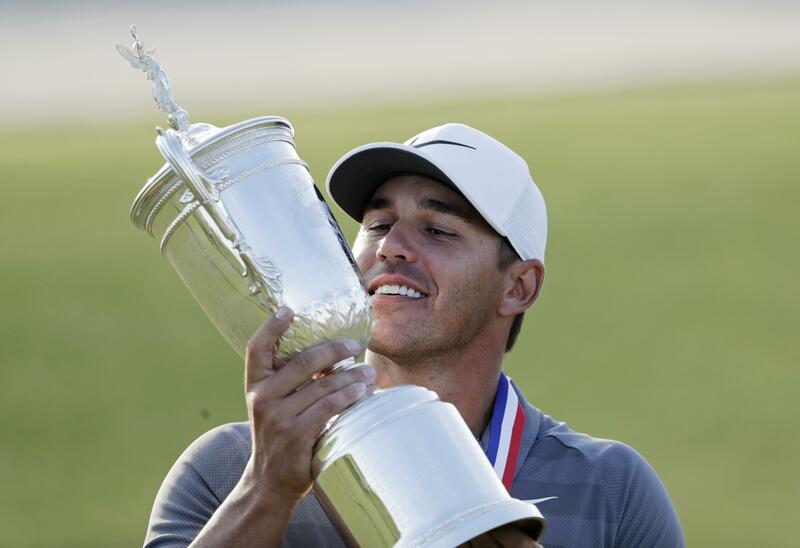 With a putting performance and calm demeanor reminiscent of Retief Goosen when he won the previous U.S. Open at Shinnecock Hills, in 2004, the 28-year-old Koepka began the back nine with three pivotal putts – one for birdie, one for bogey, one for par. He wasn’t through. He hacked out of the hay over the green at No. 12, pitched beautifully to 7 feet and made the par. Two holes later, after another drive into grass so thick he wasn’t sure he could get it out, Koepka rolled in an 8-footer for another par save. Dustin Johnson, part of the four-way tie for the lead to start the final round, couldn’t keep up with one of his best friends. Johnson was one shot behind at the turn until a trio of three-putt bogeys on the back nine. A birdie on the final hole gave him an even-par 70 to finish alone in third and remain No. 1 in the world. Masters champion Patrick Reed flirted with the second leg of the Grand Slam. He was tied for the lead when he ran off five birdies in his opening seven holes. Reed spent too much time in the high grass on the back nine and closed with a 68 to finish fourth. Americans have won the last five majors – all of them in their 20s – and Koepka joined an elite group as only the seventh player to go back-to-back in what is regarded as golf’s toughest test. Next up is Pebble Beach, and a chance to join Willie Anderson as the only player to win three in a row. Anderson won his third straight in 1905. Ben Hogan won three straight that he played, missing in 1949 after nearly getting killed when his car struck a bus. Published: June 17, 2018, 5:29 p.m. Updated: June 17, 2018, 6:44 p.m.